On Thanksgiving in addition to overeating and spending time with family, I often find myself thinking about America and what it means to be an American. In today's blog, I'm going to focus on what it is to be an American knitter. 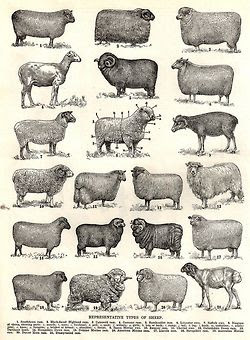 One of the things I love about knitting is learning how traditional techniques and styles were developed to fit cultures and environments and the wool of sheep selectively bred to those environments. 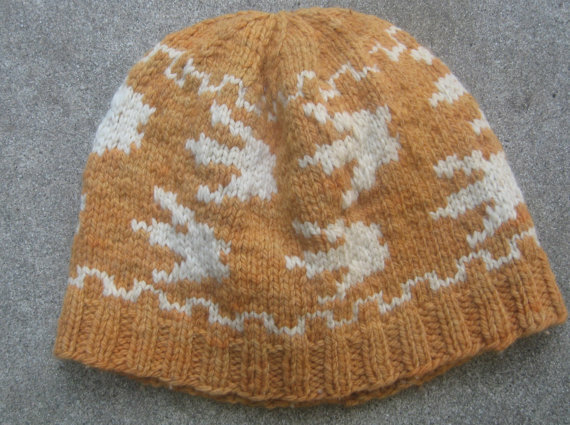 But when I read about Shetland or Icelandic wool and knitting, for example, I feel a sense of loss. As an American, I come from a mix of imported cultures. American fiber history is the same. I can only think of two natural fibers indigenous to North America--Quivit (musk ox) and American bison. Both are harvested from wild animals and therefore prohibitively expensive. 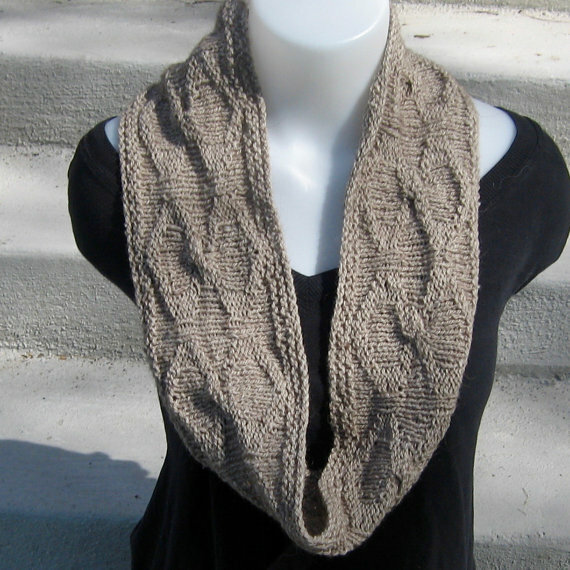 This scarf contains a mixture of wool and bison fiber. It is available in my shop. 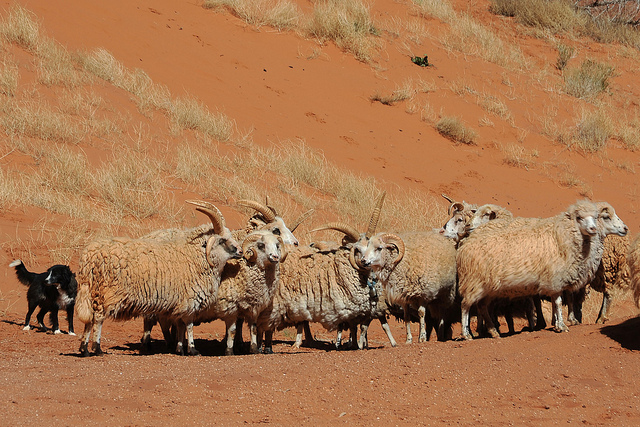 The Navajo churro sheep come close. They were brought over by the Spanish many centuries ago and have become the core of traditional Navajo culture. But I've never seen any knitting yarn made from their hair. I assume it's quite coarse and strong since it is usually used in weaving beautiful rugs. Native Americans create beautiful patterns in textile and pottery that I am sometimes tempted to copy in my designs. But I don't feel right about it. Without guidance, I don't know what patterns still have cultural or religious significance and which are merely decorative. Wool hat in Incan pattern from my shop. I have stolen some Incan images. That might be easier because Peru is farther away, but it is giving me second thoughts about my baby sweater patterns. I may present design choices from multiple cultures. I have genealogical rights to Celtic and Scandinavian patterns. Do these patterns represent anything? I don't know, but the hat is in my shop. Hand prints in natural wool colors from my shop. 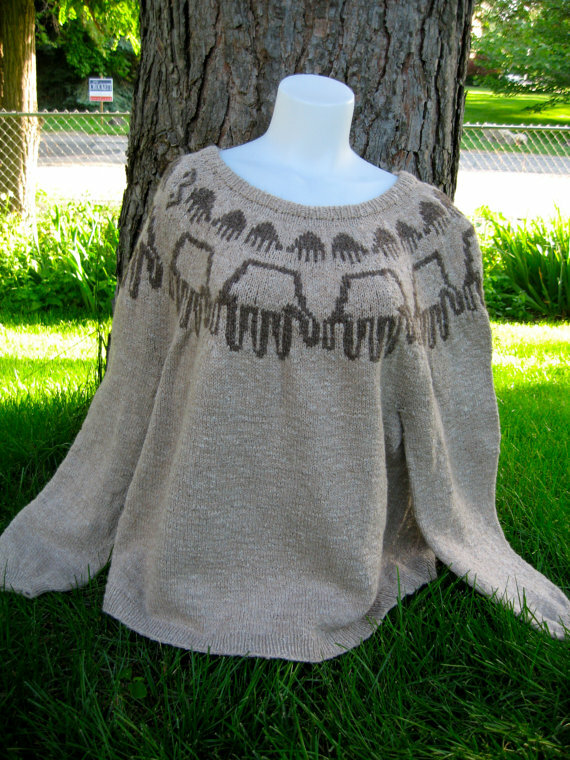 I give myself permission to use Anasazi designs because they are a vanished people. About ten years ago I hiked through Horseshoe Canyon in Canyonlands National Park. That canyon is an art gallery of ancient petroglyphs. 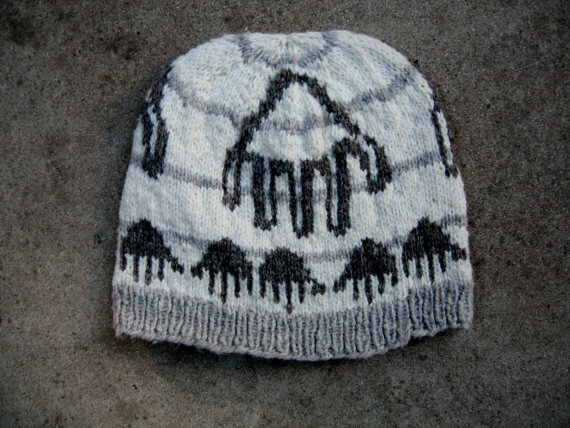 I was touched by the age and mystery of the pictures and had to express myself in wool. So I have made several sweaters and hats bearing those images. One is a personal favorite sweater. I wear it camping and around the house whenever I am cold. I am wearing it right now. Knit of a natural-colored blend of merino and alpaca it has (rather square) rattlesnakes around the neck knit in cream-colored yak. Kind of daring hand prints, in my shop, of course. My sweater was the rough draft. 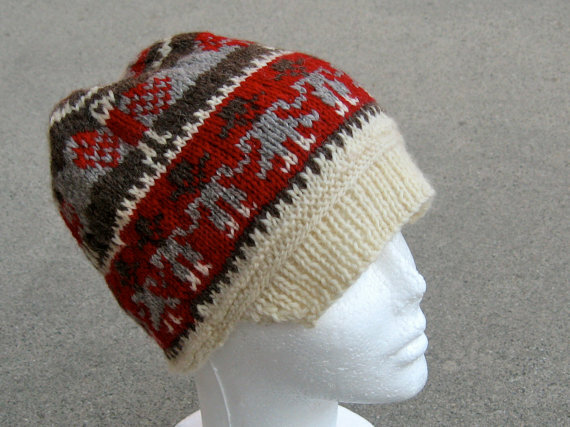 Its successor is made with the same materials, but with brown yak. It is covered with hand prints. I love the hand design because it is so universal. I saw it all over the Anasazi art. Hand prints were also painted in the French caves and by Australian first peoples. These are the signatures of pre-literate people. But hand prints are still used as a unique mark of identity. I've put my hand prints in wet cement by my childhood home. I treasure my sons' finger paint and plaster prints. Famous people leave their hand prints on the Hollywood Walk of Fame. Now I use a thumb print to open my iPad. There are also two more colors in my shop. Last summer I went further back in time. A trip to the desert made me think of even more ancient inhabitants of my home. These I can copy without guilt, so I made three T-rex hats and two with dinosaur tracks. 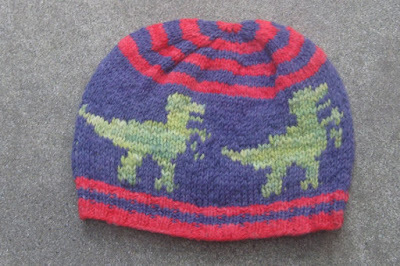 Since dinosaurs star in many of my favorite movies, they make a good segue into my other line of "American" knitting. Pop culture has been our biggest export for several decades now. 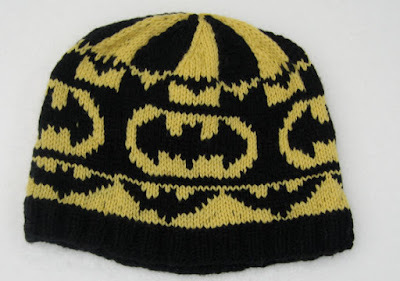 I've made and sold many hats inspired by sports teams, movies, comic books, and video games. That gets a little sticky on Etsy. Companies have the right to watch out for their copyrights. You can request custom colors in my shop. But please don't expect new projects before Christmas. So far I have only been called out by Minecraft. It was a good reminder to avoid newer ideas. 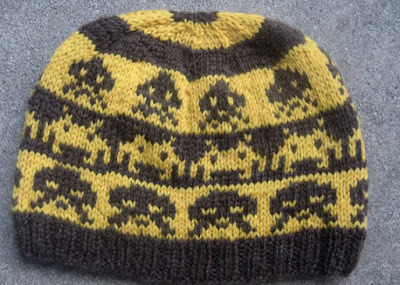 I've had the most success with vintage video games, especially Space Invaders. 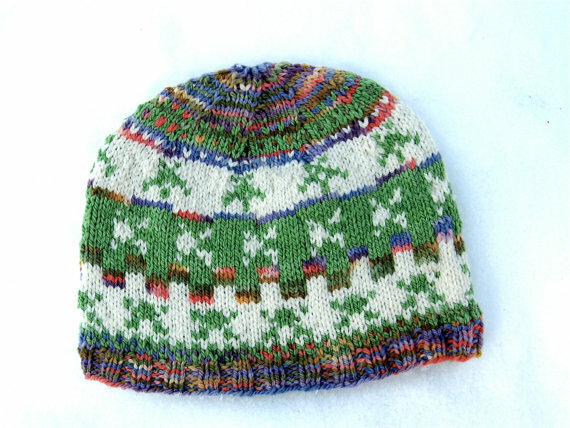 One of three frogger-inspired hats in my shop. 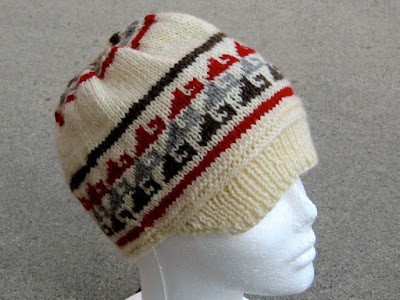 Thinking about this blog inspired two more Anasazi hats. These are made from local Wyoming merino (mountainmeadowwool.com) in sandstone shades naturally colored with dyers' coreopsis. I found them on clearance and am pretty sure they were part of an experiment. I finished these hats and washed them this morning. Once they are dry enough to be photographed properly, I'll update this section and list them in my shop. I'm also working on a skirt pattern, which involves a lot of easy knitting. I've half-finished the knitting for a skirt in my size, then I'm going to see if my formula scales down. I'm grateful that Thanksgiving is over. I don't know why I was stressed, but putting the day behind me has been a relief. I think the main issue is that I hurt all week and wasn't sure I would be up for the occasion. On Monday, I drove myself half an hour away and back to sign up with a disability lawyer. My body refused to work right afterward. For me, "up for the occasion" required simply attending. My mother-in-law has hosted Thanksgiving forever and I hope she will continue to do so for many years to come. Last night's dinner was tasty and the event was harmonious, with the only tears coming from the very youngest kiddos at the very end of the evening. I am thankful for the passionate family into which I married and their gracious acceptance of my leftist hippie self. I'm very thankful for my family of origin as well. We are an accommodating lot, leaving Thanksgiving proper to the other sides of the family and meeting later. Our Thanksgiving this year will be on the first Sunday of December.